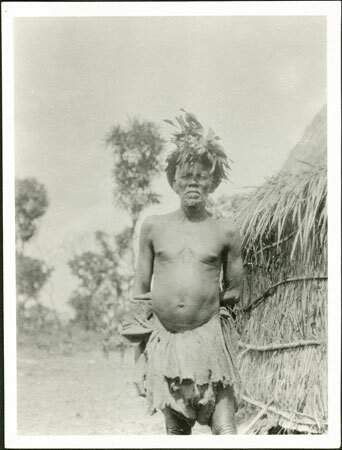 A three-quarter length portrait of a man (identified as a man of the Bukuru people), standing next to a grass-walled hut wearing a feathered straw hat. One branch of the Bukuru (Babukur) people lived under Avongara suzerainty as a subject people in the Sueh valley to the north of Yambio. Such peoples were considered Azande although were further designated auro or outsiders. Notes on print/mount - There is a partly obscured pencil note on the print reverse which indicates that the first part of the film number should be 52/2, the +44 being obscured by a corner tape. Morton, Chris. "Portrait of a Zande man" Southern Sudan Project (in development). 03 Jan. 2006. Pitt Rivers Museum. <http://southernsudan.prm.ox.ac.uk/details/1998.341.459.2/>.